Fire up any computer running Windows 7 or 8 and you'll be used to a message or three inviting you to upgrade to Windows 10. But the latest pop-up screen doesn't even give you a choice. The large pop-up screen, which first appeared over the weekend, gives users the option of upgrading straight away or ... that evening. Users can still opt out by clicking on the red 'X' in the top right corner of the window, but less savvy computer users (part of Redmond's core market segments) might not figure that out. This is not a new idea; it's called the assumptive sell and has been in pop-up ads for years. But it's not the kind of tactic you'd expect from a respectable firm like Microsoft – or at least, not until Windows 10 came along. 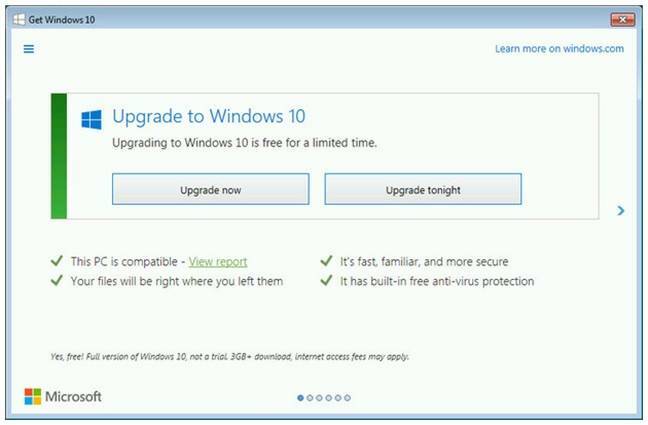 When Microsoft announced in January that Windows 10 upgrades would be free for users of versions 7 and 8 in the first 12 months after release, many people were pleased. But as time has gone on it has become clear that Windows users aren't being offered the upgrade, so much as having it rammed down their throats. Besides the pop-ups, Microsoft has already added the Windows 10 upgrade as an "optional" update in its monthly Patch Tuesday cycle. But early next year that will be changed to a "recommended" update, meaning that those who have set the patching cycle to Automatic will download the new OS by default. This is partly behind predictions from analysts about how Windows 10 upgrades will bloom next year. That's something Microsoft will be praying for, especially since Windows 10 installations have been lagging of late. "Windows Update is the trusted, logical location for our most important updates, and adding Windows 10 here is another way we will make it easy for you to find your upgrade. Before the upgrade changes the OS of your device, you will be clearly prompted to choose to continue."